Well it’s an 8-8-8 date today, again. Hy-Brasil was an island which appeared on ancient maps as early as 1325 and into the 1800s. On most maps, it was located roughly 321km (200 miles) off the west coast of Ireland in the North Atlantic Ocean. One of the most distinctive geographical features of Hy-Brasil on those maps is that it often appears as a circle with a channel (or river) running east to west across the diameter. Stories about the island have circulated throughout Europe for centuries with tales that it was the promised land of saints or a paradise where an advanced civilization lived. In Irish myth, it was said to be clouded in mist except for one day every seven years when it became visible but still could not be reached. How human language began has been a question pestering researchers for centuries. One of the biggest issues with this topic is that empirical evidence is still lacking despite our great advances in technology. This lack of concrete evidence even once led to the prohibition of any future debates regarding the origins of communication by the Linguistic Society of Paris. There’s an area in the Peak District of northern Derbyshire that’s known as the Bermuda Triangle of England because over 50 planes have crashed there, killing over one hundred people. Dark Peak gets its name from its color and its reputation as a home for ghosts and aircraft apparitions, especially since World War II. That tradition continues through today as a number of witnesses recently spotted a WWII-era bomber flying low and silently over Derbyshire. 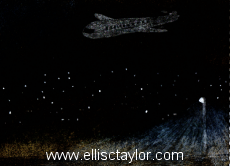 Not in Derbyshire, but my drawing of a stationary (and silent) plane that I watched over the village of Eynsham in Oxfordshire, one night. If this theory is correct, it would make the script the oldest written language ever found, predating the Sumerian writings in Mesopotamia, and possibly even the Dispilio Tablet, which has been dated 5260 BC. Is the Danube Valley Civilization script the oldest writing in the world? At least 23,000 Sinti and Roma were held in Auschwitz concentration camp. the vast majority lost their lives as a result of hunger, diseases, brutal treatment, or the gas chamber. After a long and courageous struggle, Anne Strieber died on August 11, 2015. She founded Unknowncountry.com as Whitleysworld in 1998. In 2001, she changed the name and expanded it to include what she described as “the credible edge of science and reality.” She was its managing editor until January of 2015. Anne was also a novelist, and published three books, “the Cave” as Anne Matthews, “the Invisible Woman,” and her personal favorite, “Little Town Lies,” both as Anne Strieber. In nonfiction, she published “the Communion Letters,” a compendium of letters from close encounter witnesses. She was also the author of “Anne’s Diary” on this website. She also co-authored an account of her illness, “Miraculous Journey,” with Whitley. I first heard of the work of Whitley and Anne Strieber in 1996, probably through my friend Mary Rodwell. For several years I couldn’t bring myself to look at their work but around the turn of the millennium I eventually watched the film, ‘Communion‘. I’d seen the ‘alien face’ on the front cover of the book, but it didn’t concur with any of the ones I’d seen…but, the experiences that are depicted in the film did, and big time. With Christopher Walken (in a fabulous performance as Whitley Strieber) it became one of my favourite films, but I still haven’t read any of the books. This entry was posted in Ancient, Biological warfare, Ceremony, Codes, Consciousness, Crime, Health, Howlin' at the moon, Interviews, Literature, Mysterious, Science, Uncategorized and tagged anne strieber, Auschwitz, autism, Christopher Walken, communion, danube, dead doctors, eynsham, gsmaf, gypsies, Hy-Brasil, ireland, language, mysterious islands, mysterious plane, oldest writing, oxfordshire, pek district, phantom islands, roma, Sinti, the buzz, vitamin d, wales, Whitley Strieber. Bookmark the permalink. ← Who Was Victor Hugo?